Firefly and the armoured airhead. As can be seen in the photo below, this bolt blew a 1 1/8″ hole through the helmet. 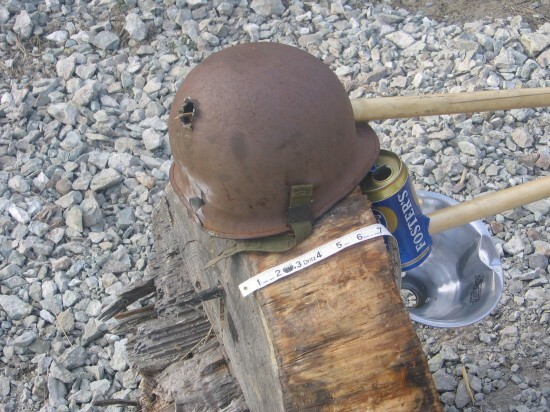 After exiting the helmet the shaft snapped off, but not before it had sunk the entire 7″ length of quadrobate steel tip into the pine backstop. While this shot did not quite exit the pine block, the previous attempt on the Foster’s lager penetrated through the log by a couple of inches. The distance here is a very short 15 yards. These tests will all be repeated at longer ranges as Firefly becomes more developed. What correlation there may be between a relatively modern piece of armour, and a piece that would have been in use during Roman times, is not something I know much about. However, with this much over-penetration, it seems doubtful that an ancient warrior could lug around enough conventional armour to have any real protection against these nasty little darts. Here’s a vid for Aussies. And yes Melissa, the schlep is strictly ham. Bundles have settled. Consistency at last. As mentioned in a previous posting, the original Roman glandes would likely have been tossed out of their machines by some kind of special pouch arrangement integral with the string. We are not far enough advanced in our project to be able to do that yet, hence the special bolt to deliver our experimental payload. Here is the video of what that “delivery” looked like. Stats are: Bolt weight 10, ooo quirkily precise grains, velocity 264.5 fps, energy 1553 fpe. Firefly seems to be doing pretty well despite her bent kamarion and slightly buckled starboard field frame. The broken strand in her starboard torsion spring does not seem to have progressed to a more general loosening of that bundle. I am going to make repairs ASAP, but it is heartening to see her doing so well despite the damage. Visible in the above video is the curious phenomenon of having the starboard limb retract further than the port one, presumably the result of that aforementioned damage, and yet the bundles seem to be balanced well enough that the bolt flew straight and true. This is another big, “go figure”. It is almost as if she yearns to perform well. 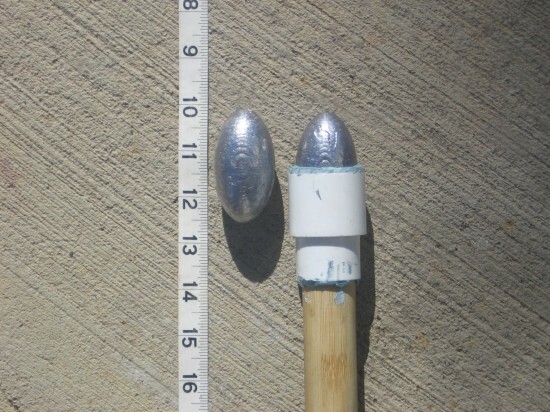 This lead glans is the heaviest projectile we have fired out of Firefly so far. As a result, the velocity was down from an average 300 fps with the 7,000 grain bolts, to 264.5 fps with this 10,000 grain bezonian. As far as energy goes, that was up by a couple of hundred foot pounds or so. Cap’t Harpoon had predicted as much in one of his previous comments. Clearly, we need to do more exploration with these super heavies. Below we see a lead limpet clinging to our concrete block. There appeared to be zero damage to the block. Only some plumbous graffiti was left to mark that anything had happened at all. These comparative impacts on our concrete block would seem to rule out lead glandes as being the prime suspect in creating impact craters in ancient walls. Perhaps if the wall was made from sandstone or something equally soft, lead projectiles might make more of a crater. It may be worthwhile to consider what effect could be achieved by melting some antimony in with the lead before casting the glandes, to form a harder projectile. However, my experience with hand cast lead bullets for handguns tells me it probably wouldn’t make much difference. When relatively slow moving chunks of lead, be they hard or soft, hit something square on like a rock, they really only do one thing ……. go splat! 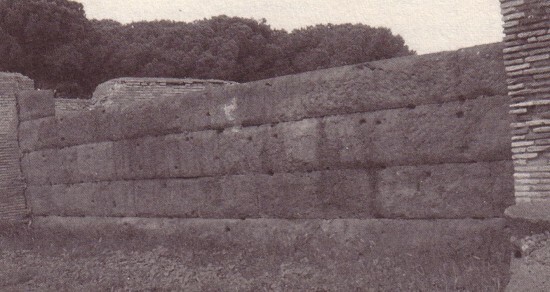 Also from Dr. Tracey Rihll’s book, The Catapult, are these photos of a wall in Ostia. Crayon work by me. Did the victors chisel the bolt heads out of the wall as I did the other day? 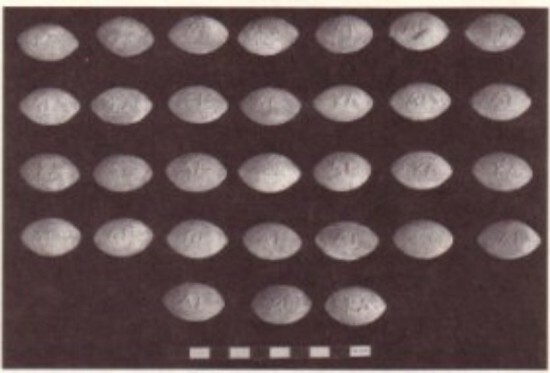 Or was this the work of lead glandes or heavy stone balls? Under better magnification there appears to be more craters towards the left than is apparent by a casual observation of this photo. Probably a good number of the ones I’ve marked are not valid. Still, it is interesting to muse on what the wall would have looked like after this ancient bombardment. I tried pulling on this bolt head for quite a while. It wouldn’t budge. Knocked on it all ways, I did. With a 4 pound hammer too. It’s recalcitrance was amazing. The 2 3/4″ inches of hardened steel embedded in the block defeated all my attempts to remove it by tugging and hammering, so eventually I hauled out the cold chisel. 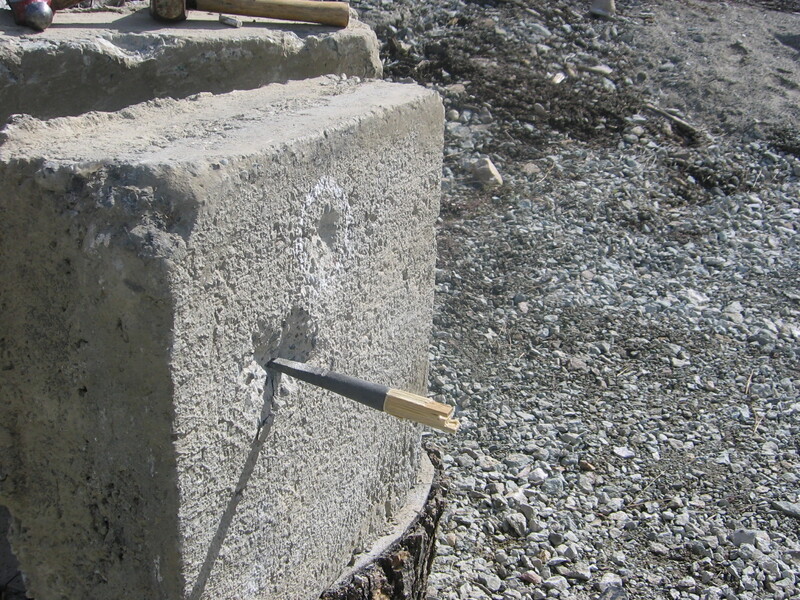 Then it hit me, possibly some of the holes in that wall at Pompeii are the size they are because someone chopped the bolt heads out with a cold chisel. It is the only practical way I know of to extract one of these bad boy stilettos from concrete masonry. For Joel (AKA Cap’t Harpoon, Warhammer etc.) re: his comment, — Okay yes!, legionaries could have lugged around a whacking great crowbar of the sort used to pull railroad spikes. Not a bad plan, until the poor noodypoll that has to carry it, dumps the thing in a ditch somewhere. Also, it probably would not have been terribly effective for overhead work if you are standing on a ladder. Cold chisels seem way more Occam. The next two videos give some idea of this “recalcitrance”. It actually took about 1/3 longer to get this one out than shown in the above vids. 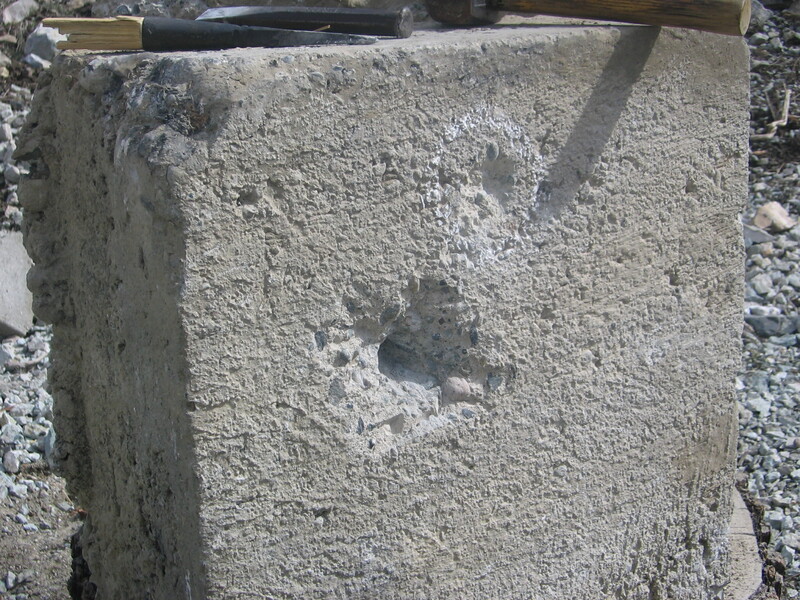 Here is what the concrete block looked like after it had undergone it’s boltectomy. It seems to me that with the right wall material, a good artilleryman would have been able to make a veritable ladder out of well aimed ballista bolts. Perhaps not all those impact craters at Pompeii and elsewhere were the random misses we have supposed. If the wall you are trying to scale, suddenly sprouts a pattern of well anchored pitons, that may have provided a useful advantage for an attacker. When I was a young fella in my 20’s, I learned the power of Tuesdays. It goes like this. I am furiously hack sawing or filing away at 3.00 o’clock in the morning on various parts for this item. Eventually, the Rebecca would pad, bleary eyed, out to the potting shed where I had set up a workbench and vise, wanting to know what an Earth I was doing. “Tuesday…I have to get it done by Tuesday” was the mumbled reply. This happened half a dozen times until several Tuesdays slipped their way into history, and she demanded to know which particular Tuesday it was I had in mind for completing my maniacal labors. “Tuesday….. got to get it done by Tuesday” I continued to mumble. After a while she simply smiled, gave me a kiss and wandered back inside to do whatever it is Rebecca’s do in situations like this. Brute that I am, It didn’t take long to realize that this was the perfect answer to any number of questions of the temporal sort. “When are you going to mow the lawn?”. Answer: “Uh, ….. how about Tuesday, dear”. “when do you think Zoe will have her puppies?”. Answer: “Tuesday I should think. Definitely Tuesday”. ……….. Well, you take my point. As every competent catapult maker knows, it takes a good breakfast to rearrange the molecules into a functioning machine. Here is what has been powering our efforts these last several years. Broccoli porridge surprise. 1 large head of broccoli, whacked into largish chunks. 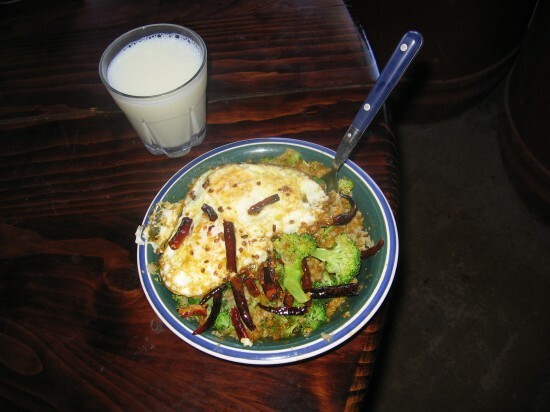 Microwave broccoli for 5 mins in dilapidated oven, cook oatmeal over camp stove for 5 mins, sautee chili peppers for 4 mins over medium flame and then fry eggs over-easy until firm. Mix broccoli, oatmeal , curry powder and salt into homogeneous mass. Plop eggs and chili peppers on top. Pour glass of skim milk to act as fire retardant. Consume on daily basis and turn into catapult. Yum yum yum, yum, yum! Post curry jubilation with Kenz & Co.
Before we get to the lab work, and videos of speeding nasty things, a little background is needed to place our efforts in some kind of socially redeeming context. Kinetic prurience aside, we do have standards after all. Professor Tracey Rihll from the University of Swansea has written a book about the history of the catapult, titled logically enough, The Catapult. This isn’t just any book. It is a mind bending trip into the world of ancient technology. I was left exhausted after every chapter, my simple mechanic’s brain overloading as it riffed on all the possibilities for future experiments here in the little catapult factory. By any measure, this is “THE” book to get if you have any interest in this deliciously arcane subject matter. Hats off to the good doctor. To all catapult noddies and genetically deranged toxophilites: go get a copy!, you won’t regret it. It is from Tracey’s book that we copy the following photo. 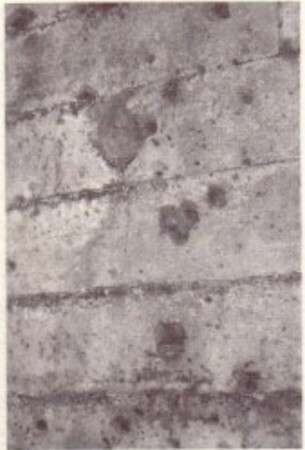 These are impact craters that appear to have been made by heavy fast moving objects. They are located on the walls of Pompeii and are almost certainly the work of ancient ballistas. 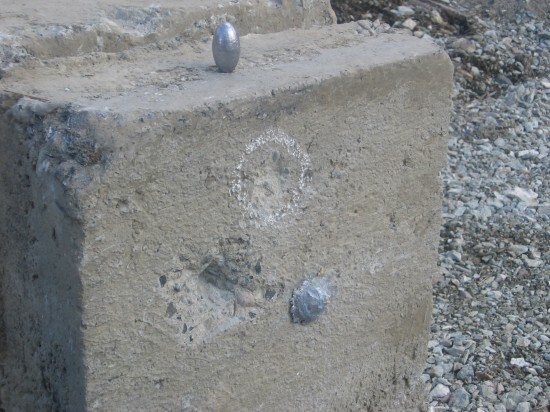 In general there are three types of missiles thrown by ballistas: iron headed bolts similar to the ones we have been using in our testing , lead and sometimes stone bullets known as glandes (glandes is plural, glans singular), and finally stone balls of a suitable diameter. 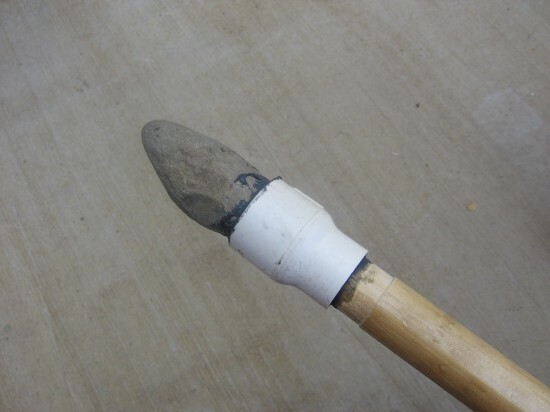 Glandes are found through out the ancient world and Dr. Rihll has made a compelling argument that they were very likely used as catapult ammunition. It had long been thought that these artifacts were used solely by hand slingers. The ballistic coefficient of a lump of lead is naturally higher than that of a stone projectile, and so, Goliath’s forehead notwithstanding, the lead glandes were considered by most scholars to be part of the natural evolution of the sling. 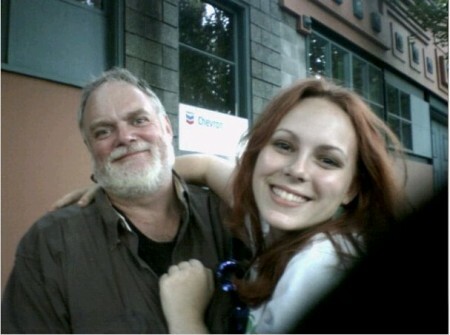 Here is a photo of some of them, also taken from Tracey’s book. “Let them eat eggs” would be a suitable motto for these little lead pills. Most of them will sit in the palm of your hand like an extra large AA chicken egg, on steroids. Many were actually inscribed with taunts and jeers. “One in the eye from Biggus Dickuss ” etc. etc. The current state of development of Firefly does not allow for the firing of glandes and stones. That will probably require a special string with an integral pouch of some kind. 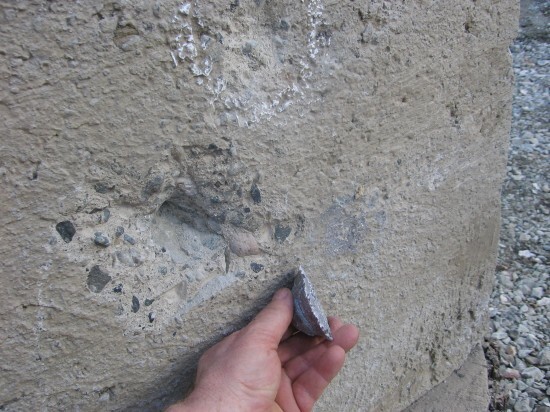 However, that does not necessarily stop us from smashing glans shaped lumps of lead and stone into a block of concrete to see if we can duplicate some of the impact craters seen on that wall from Pompeii. And so finally, to the fun stuff. We start with a rerun of that test done the other day shooting one of my standard bamwood bolts with a hardened steel quadrobate tip into a building pier. This time however, the pier grew a bit. We wouldn’t want to skew the results by using a puny target medium. The block in the following video weighs about 500 lbs and has been sitting in the dry Okanogan topsoil for the last thirty years. It seems a plausible substitute for that wall from Pompeii. At least, it is the best we have right now. Stats for the above shot are: Bolt weight 7160 grains; bolt head 4140 steel, quadrobate shape hardened to 40 Rc. ; velocity 298 fps; energy 1411 fpe (1914 J). The bolt head penetrated into the block to a depth of 2 3/4 inches and left a surface crater 4″ in diameter by 3/4″ deep. The photo below shows the state of affairs before I attempted to remove the bolt head from the block. ———————————————————————————————————————————————— Moving on to the next shot, we tried our tarted up version of a stone glans. The photo below shows what we came up with for a delivery system. The shaft of this special bolt is made from a 1 1/8″ bamwood broom handle. 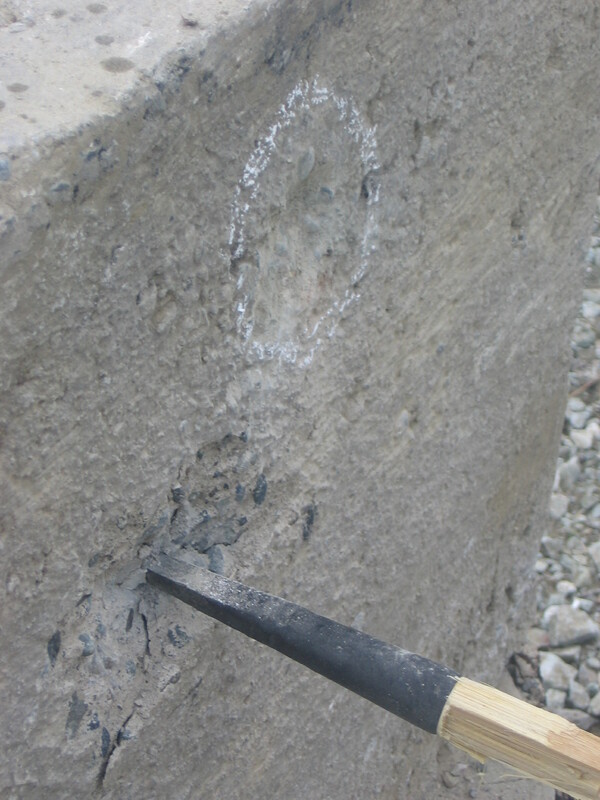 Because it is highly unlikely that the concrete block would know there was a wooden shaft attached to the rear of our ovoid shaped piece of granite, it seems reasonable to assume that this test is a pretty good indication of what the crater would look like from a speeding stone glans. How likely it would be for a free wheeling egg shaped projectile to strike end on is unknown, however, this angle of attack would seem to give the best chance of leaving some kind of mark on the block. Stats from this shot are: Bolt weight 7561 grains, velocity 291 fps, energy 1421 fpe (1927 J). From the video it appears that the bolt is moving tail down. This is probably the result of the larger than usual head diameter. The bolt sits on the machine at an angle, after that all bets are off for transferring a purely linear force vector into the projectile as it trundles down the bolt groove. It is clear that at these velocities the stone glans simply disintegtates on the surface of the block. The previous photo shows a small crater made by this shot. It is outlined by the chalk circle and measures 2 inches in diameter and just under 1/2 inch deep. Not at all the thing if you want to leave your mark for posterity. Although there do seem to be some pretty shallow craters on that wall from Pompeii, so maybe….. 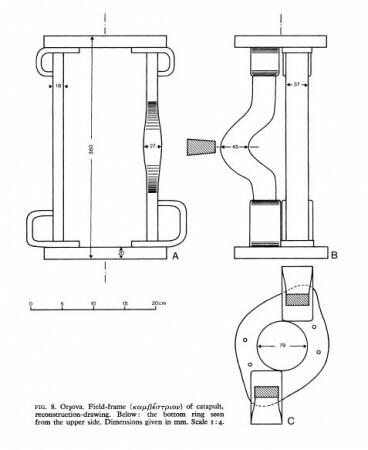 Although a number of very excellent works have been published that contain sections about late model, iron framed, Roman ballistas, it seems that there is relatively little written about full scale reconstructions that delve into the probable performance characteristics of these machines. This is hardly surprising given the amount of work involved making a reconstruction that is both plausibly authentic, yet powerful and accurate enough to be considered a viable weapon of war. While it is far beyond the scope of this study to investigate all the forms and sizes of iron framed ballistas in use during the late Roman empire, it is possible for us to explore one of them. The field frame and kamarion that were discovered in Orsova, contain most of the important pieces of information needed to make a working replica. These can be listed quite simply as: (1) the diameter of the holes in the end caps on the field frames, (2) the distance apart that the rope bundles occupied when installed in those field frames, (3) the geometric relationship between the stanchions and loops on the field frames, relative to the tangs on the forks of the kamarion. The artifacts also provide the dimension of the arch in the kamarion and the internal size of the loops on the field frames. The overall height of the field frame provides a suggestion of how long the torsion springs would have been, but without the washers and crossbars there is no way to know for sure. With the salient dimensions mentioned above, it has been possible to reconstruct a machine where the geometry of the artifacts makes simple and practical sense. There is an internal logic contained in the relationship between the original field frame and the kamarion , that once fully understood, makes any attempt to reassemble them using interpretations from the ancient texts, a secondary and less compelling matter. The purpose of this project is to suggest not only how the original Orsova artifacts fitted together relative to one another, but also to perform a complete range of ballistic tests using a full scale reconstruction. Our task is to reproduce the highest levels of performance possible with a machine based on the Orsova artifacts. Because the Romans had generations to perfect the performance of their late model ballistas, it seems logical that if we are to accurately model the capabilities of the original machine, then we must make every effort to have our reconstruction shoot as powerfully, accurately and reliably, as it possibly can. The safe bet is that the Romans certainly did. Our starting point for making a full scale reconstruction of the Orsova ballista were these drawings taken from, Recent Finds in Ancient Artillery, by Prof. Dietwulf Baatz. Later in the project it became necessary to make a new and stronger kamarion, at that point we became aware of the following drawing by Aitor Iriarte from his paper in JRMES 11 2000 47-75 . Only the cross sectional dimensions from this print were used to make the second kamarion. The above drawings are the only dimensioned sources that were used in making our reconstruction. In those instances where actual dimensions were not called out, every effort was made to scale these drawings accurately The premise we are operating on is that these drawings are accurate representations of the original artifacts. If there is any debate about their validity, it is not the concern of this paper, or our reconstruction efforts, to resolve those issues. These drawings represent the given parameters for the following body of work. Everything rests on them. (2) When in doubt on how to proceed, always opt for the design alternative that will yield maximum performance and reliability, consistent with rule one. This will insure that our intent, at least, will always stay on the same path as the original creators of the Orsova artifacts. (3) Use the minimum amount of modern materials; and when we do, have a very good reason for doing so. As with any enterprise of this scope there are always provisos. The following caveats address the major concerns posed by this last principle. The Romans probably used sinew to power their torsion engines. Sinew is made from tendons. These tissues, extracted from animals during rendering, have high elasticity and strength not found in other natural fibers. The historical record shows that horsehair or human hair could be used to make torsion springs, but it is doubtful these two alternatives would have bested sinew in high end power. Because it is far beyond the scope and expertise of this artificer to attempt to duplicate a full size torsion spring in sinew, we will need to turn to modern materials to power our machine. 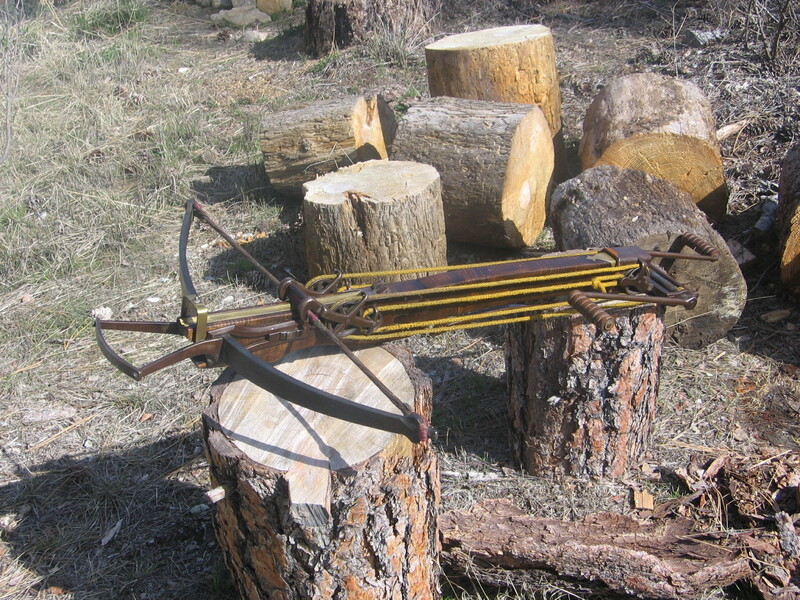 For the same reasons mentioned above, the bowstrings used on our machine are made from dacron rather than sinew. Comparative small scale tests may also be run at some time to ascertain the likely differences between this modern material and sinew. Because the Romans used rivets in place of any fastening system based on screw threads, we need to indicate our reasons for using modern nuts and bolts to secure various parts of our machine. Largely it is a matter of convenience when it comes to swapping out parts on the machine as the design progresses. In every instance that a screw thread has been used, the job could have been done by expert riveting. Of course with rivets, we would lose the ease and flexibility that comes with modern nuts and bolts; and because the higher purpose of our effort is to test for ballistic performance, not the intricacies of Roman riveting technique, this deviation from authentic fastening technique was judged allowable. Proviso 3 — Machining and welding. While the Romans had all the benefits of generations of skilled artisans and virtually unlimited manpower to make their super weapons, this project has only one individual, albeit with a well equipped machine shop, to attempt a modern day reconstruction. In those instances where CNC machining or Tig welding have been used, careful consideration has been given to make sure the design being replicated could have been made with the forging techniques available to the Romans. The limbs of our machine are the weak link likely to suffer catastrophic failure. Here it was deemed prudent to utilize kevlar webbing, laminated to the front and back of the limb, to limit the amount of flying debris if some kind of breakage should occur. Given these limitations, it is still expected that some useful insights might be gained about the performance of the original machine by attempting to build and shoot a full size reconstruction.